IF YOU ALREADY OWN A ROLAND R-26 YOU MAY STILL PURCHASE SOME OF ITS ACCESSORIES FROM OUR R-26 WEBSHOP BELOW. There are two types of stereo microphones built into the R-26, plus a pair of XLR/TRS combo input sockets for external mics, as well as a mini-jack input for a stereo plug-in powered mic. You can choose simultaneous combinations of the built-in mics (cardioid and omni) as well as the external inputs - yes, even all of them at the same time! Capture live performances with simultaneous line and ambient signal paths, record important speeches, lectures, and presentations, or take the R-26 into the inner city or deep forest for pristine field capture. There's no doubt this is now the world's most flexible solid state sound recorder. Want to see and hear more? Go to our R-26 Video Demo section below. The R-26 features Roland’s latest DSP engine, which allows simultaneous recording of up to six channels (three stereo channels). A large LCD touchscreen display lets you directly navigate menus for customizing the microphone settings, editing waveforms, and so on. It also features large input-level knobs for making precise adjustments. Directional and omnidirectional stereo microphones are built into the R-26, and can be used simultaneously. This unique multi-stereo mic recording system lets you capture a wide stereo sound field without spoiling the vibrant low frequencies and ambience of the venue. Two XLR/TRS combo mic inputs are built into the R-26, plus an input for a stereo plug-in powered mic, which can be combined simultaneously with the internal mics. At a live concert, for example, the R-26 can capture a stereo mix from the FOH mixer via its XLR inputs, as well as the ambient audience noise via its built-in stereo mics. 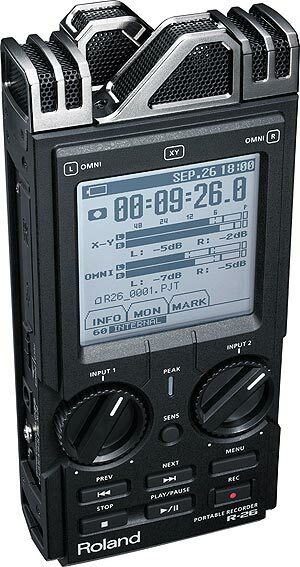 The R-26 allows up to six channels of simultaneous recording (three stereo pairs). Capture the same sound source with three different types of microphones, both internal and external. This provides a new level of flexibility after the fact, as you can choose from the individual tracks or composite mixes. You can connect the R-26 to your computer for use as an audio interface or for external storage. Use the R-26 in combination with the bundled SONAR LE software app to record and edit on your PC. The four screen shots below link to Parts 1, 2 , 3 & 4 of our fairly comprehensive presentation of the Roland R-26. Just click on a screen shot to see its video.